Car charger CR-2XP with voltmeter, 2xUSB, 12-24VDC, 3.1A, 5V CR-2XP charger for smartphones and tablets combined with a voltmeter that measures the battery of the vehicle. 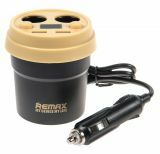 The device is plugged into the cigarette lighter socket and placed in the cup holder, providing two USB ports, two lighter sockets, and a battery voltage display. Charger for iOS, Android, 5VDC, 1A iOS Android charger with supply voltage 100-240 VAC, output voltage 5 VDC and maximum output current 1000 mA. Wireless charger, Remax, 5V, 1A Wireless charger Remax RP-W1 suitable for iOS and Android with output voltage 5 VDC / 1 A and charge range up to 10 mm. 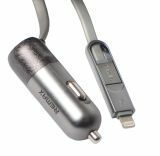 Charger for iOS, Android, with USB TYPE-C, 5VDC, 2.4A Charger for charging smartphones, tablets, iPhone with two sockets. Input voltage 100-240 VAC, output voltage 5 VDC and maximum output current 2.4 A. List Price 14.90лв. VAT Incl. 14.15лв. VAT Incl. 13.41лв. VAT Incl. Charger for iPhone, Apple products, with Lightning cable, LDNIO A2405Q Adapter for charging iPhone smartphones. The power adapter has two sockets. Input Voltage 100-240 VAC, Output Voltage 5 VDC and Maximum Output Current 4.2 A.
Charger for iPhone LDNIO DL-AC52, with lightning port, 5VDC, 2.4A Charger for smartphones, tablets, iPhone with two sockets. Input voltage 100-240 VAC, output voltage 5 VDC and maximum output current 2.4 A. List Price 19.90лв. VAT Incl. 18.90лв. VAT Incl. Phone charger for Android products DL-AC52, 100-220VAC Adapter for smartphones, tablets and other Android devices. The power adapter has two sockets. Input voltage 100-240 VAC, output voltage 5 VDC and maximum output current 2.4 A. List Price 19.90лв. VAT Incl. 18.90лв. VAT Incl. 17.90лв. VAT Incl. Car charger 12/24VDC with USB outputs, 5V, 2.1A, 1A Car power supply adapter for iPhone /iPod with USB port. Charger 220VAC for Android devices, LDNIO A2405Q, with Micro USB Android phone and tablet charger with 2 USB ports. List Price 25.90лв. VAT Incl. 24.60лв. VAT Incl. 23.31лв. VAT Incl. Car charger with USB port and 2 in 1 cable, 3.4 A, 5V High quality car charger with USB 2.0 port, Micro USB for Android devices and Lighthing port for Iphone devices. 3.4 A max current output for fast charging speed. Charger for MOTOROLA, SSW-0622, 100-240VAC, 5.9VDC, 0.375A MOTOROLA charger with output voltage 5.9 V and capacity 0.375 A.
IPhone charger with lightning cable, 5VDC, 1A Charger for iPhone with output voltage 5 VDC and output current 1 A max. List Price 13.90лв. VAT Incl. 13.20лв. VAT Incl. Smart USB car charger DL-C12 for Apple, Android and iPhone Smart USB car charger for smartphones and tablets. Output voltage 5 VDC and output current 2.1 A. List Price 11.90лв. VAT Incl. 11.30лв. VAT Incl. Car charger for smartphones, tablets and GPS navigations, 5VDC, 2.1A Car charger for smartphones. The device uses the car lighter socket. 5 VDC output voltage and 2 A (max) output current. List Price 12.90лв. VAT Incl. 12.25лв. VAT Incl. USB car charger, 12-24VDC, 5V, 2.1A USB car charger with two USB ports. Supply voltage 12 - 24 VDC input voltage, 5 VDC output voltage and 2.1 A (max) current. 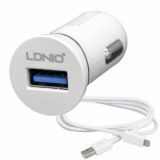 Car charger, LDNIO C304Q, with Lightning port Charger for iPhones and iPods. The device is plugged into the cigarette lighter socket. List Price 17.90лв. VAT Incl. 17.00лв. VAT Incl.